Villa Adriana Kvarner is a gorgeous villa, located on the hills above the Kvarner bay. 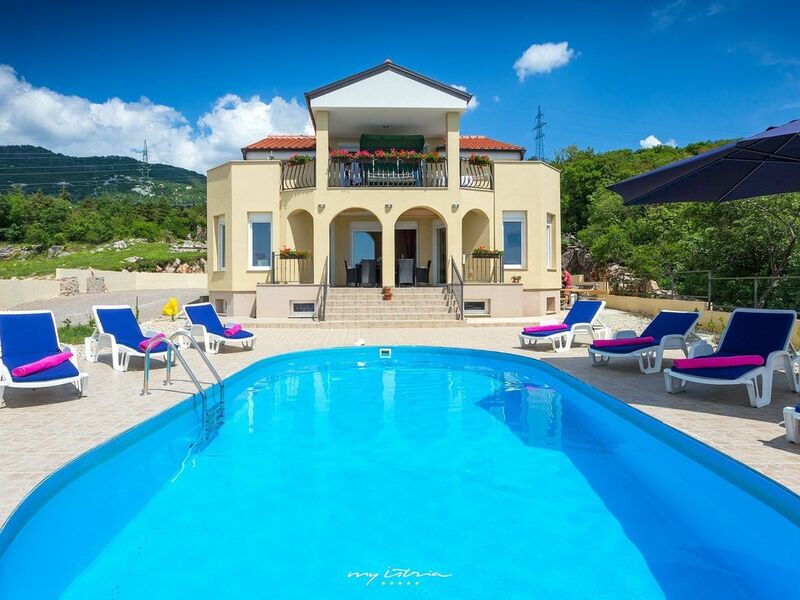 Its unique location ensures a stunning view that you will be able to enjoy throughout your stay in this villa, whether you will enjoy in the panorama of Kvarner from the private pool or while relaxing on the terrace. The property is suitable for accommodating up to 10 persons and consists of 4 cozy bedrooms. There is a fully equipped kitchen with a dining area, a living room, one bedroom with en-suite bathroom and a separate toilet on the ground floor. The upper floor consists of the remaining three bedrooms and two bathrooms. All bedrooms are air-conditioned and two of the bedrooms on the upper floor benefit from a beautiful sea view. Outside there is the already mentioned private swimming pool and an outdoor jacuzzi, as well as one barbecue and a lovely dining area that provides the perfect place for alfresco dining. Set within beautiful surrounding, this bright villa with its terraces and balconies is a true relaxation place that will unwind its guests from the moment of their arrival. Wir (2 Erwachsene und 3 Kinder) verbrachten Ende August 2018 unseren Urlaub in der Villa Adriana. Wir waren von der Unterkunft sofort begeistert! Das Haus ist in Top-Zustand und die Zimmer geräumig. Villa Adriana befindet sich auf einer Anhöhe mit umwerfendem Ausblick in sehr ruhiger Umgebung, d. h. wer Ruhe sucht, ist hier genau richtig! Die Anlage samt Pool ist sehr sauber und gepflegt, die Hausbesitzer sind äußerst freundlich, engagiert und bei Bedarf jederzeit erreichbar. Von uns gibt es eine klare Buchungsempfehlung!!! My family and I loved staying in this beautiful new modern house with an amazing view and a great pool. The house itself is lovely and there’s everything you need and more. If you prefer to stay at a quiet place and just relax this is the perfect place for you. The drive down to Rijeka and the beaches nearby are beautiful, but they all take some time depending on where you want to go. We highly recommend Villa Adriana for larger families looking for a nice place to stay during the holidays! Wir waren mit 2 Familien (4 Erwachsene u 4 Kinder) im letzten Sommer für 2 Wochen in der Villa Adriana im Urlaub. Das Haus hält sich identisch mit den Fotos. Trotzdem waren wir noch positiver überrascht, wie wunderschön es dort ist, wie sauber und wie komfortabel. Das Vermieterehepaar empfing uns sehr herzlich und war stets erreichbar. Der Pool war fantastisch, wurde vom Vermieter bei Bedarf gereinigt, alles war vorhanden, sowohl komfortable Liegen mit Auflagen, als auch Sonnenschirme, ein Grill und eine schöne Terasse mit wundervollem Ausblick auf's Meer. Die Schlafzimmer waren geräumig, alles war sehr sauber und frisch. Genauso die modernen Bäder. Die Küche war komplett ausgestattet, es fehlte an nichts. Großer Fernseher und WLAN inkl, man fühlte sich einfach pudelwohl. Zum Supermarkt waren es ein paar Autominuten, zum nächsten Strand etwas länger. Die Stadt Rijeka haben wir des öfteren besucht, dort gibt es alles, was das Herz begehrt. Insgesamt war es ein traumhafter Urlaub und eine wirklich empfehlenswerte "Villa Adriana"!!! Villa Adriana Kvarner is located in a quiet idyllic neighborhood of Hreljin. Although the place is quiet, all the main tourist centers are not far away. The first major city (Rijeka) is only 17 kilometers away, and Rijeka Airport is just 14 kilometers away from the villa. The beautiful Mediterranean town of Crikvenica is just a short drive away. Crikvenica is one of the most popular tourist destinations in Croatia where you can find beautiful sandy beaches, beautiful promenades and kind people as well as plenty of attractions such as aquariums, adranaline parks, etc. but if you are in the mood for sightseeing, explore nearby islands like Krk, Rab and Lošinj.